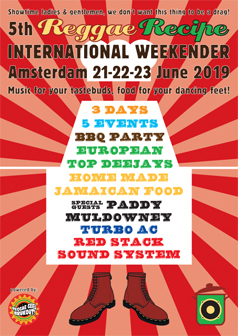 The 5th edition of our annual Reggae Recipe International Weekender has been confirmed for 21, 22 and 23 June 2019. Click here for complete programme. It’s one week later than normal in order not to overlap with the Dutch Lions Scooter Rally. So, if you’re into reggae AND vintage scooters you might consider going Full Dutch and make it a holiday between two back to back top events. Dutch Lions Scooterclub © 2019 All Rights Reserved.